Created in 1901, by scenic artist, Daniel O’ Connell, Tiffin Scenic Studios has become one of the country’s foremost stage designers and manufacturers. Housed originally in an old theater building, the studio’s first activities were centered mainly on painting, finishing drapery and refurbishing drapes and scenery for trouping vaudeville and opera companies. During prohibition, the business moved to a building formerly used as a brewery. The size and shape of the brewery building proved to be ideal for housing the multiple paint frames and the motorized paint bridge essential to the scenic trade. 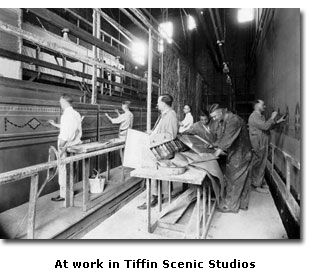 During the 1920’s and 30’s, Tiffin Scenic equipment was installed in over 190 commercial theatres throughout 22 states. 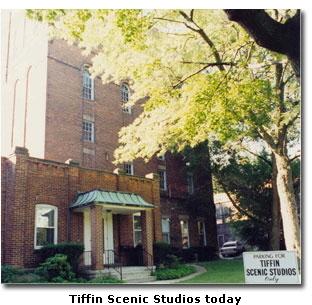 Tiffin Scenic Studios was incorporated in 1941 with James F. Kuebler as the president and major stockholder. Under Mr. Kuebler’s direction, the focus of the business shifted from painted scenery to stage machinery. This shift in emphasis appropriately reflected the diminishing activities of vaudeville and its related scenery requirements. His inherent mechanical aptitude and technical genius produced many stage rigging innovations with a basic thrust toward safety features. As a result of Mr. Kuebler’s dedication, Tiffin Scenic equipment has become synonymous with fine quality and dependability. 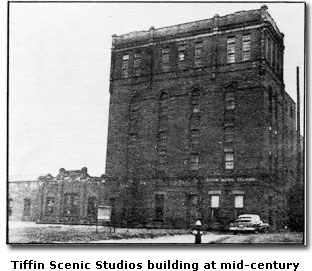 Tiffin Scenic Studio’s 23,000 square-foot facilities include 15,000 feet of manufacturing space, 6000 feet of enclosed steel and equipment storage with the remaining area devoted to offices, engineering and drafting space. The sixty-five foot tower portion of the building is equipped with a small gridiron section at the top and four runs of typical T-bar guides which allow sixty feet of vertical travel for the development and testing purposes with winch and counterweight rigging. Major shop equipment includes five lathes — the largest of which is capable of turning 30” diameter sheaves, four overhead electric trolley hoists, one radial drill, three spindle drills, one milling machine, three metal cutting band saws and one reciprocating metal saw necessary for the manufacturing of high quality, precision stage machinery. Other equipment which augments Scenic Studios’ capabilities include a 1/4” x 5’0 plate shear, one alligator shear, a forming press and a punch press as well as grinders, bolt threaders, arbor presses and forming dies. Tiffin Scenic Studios provides all essential pattern equipment for making a very large variety of sheave castings at the foundry. Their foundry source pours 30,000 psi tensile inoculated semi-steel. This ensures maximum strength in their stage rigging. A ventilated spray paint area with a trolley conveyor and two welding shops complete the manufacturing facility.